The Young Player of the Year award is a category which I always find fascinating and something of a conundrum. The PFA award, which is voted for by the players throughout the four divisions of English soccer, is open to any player who was aged 23 or under at the start of the season. That is actually quite a broad age range for players to be eligible for the award and it leads to some interesting choices. For instance, last season’s winner of the PFA Young Player of the Year award was Eden Hazard. By the end of last season, Hazard had played 300 competitive club games for Lille and Chelsea. It seems a bit strange that someone with so much experience of playing top-level football should be a contender for a Young Player of the Year award. Personally, I think the Young Player of the Year award should be restricted to players who have enjoyed a breakthrough season in the Premier League or have properly established themselves in the team for the first time in their careers. The issue I found with using such criteria is that, for this season at least, there are actually very few players who you could say would fulfil what you are looking for. It’s not to say there are no young players in the Premier League, it’s just that the vast majority of them have already got two or more seasons of experience on their CV. However, there are five Premier League players from this season who have both made an impact for their clubs and could also justifiably be considered to have enjoyed a breakthrough year at the highest level. So, here goes with the five who would be more pertinent and relevant winners of the PFA Young Player of the Year award. It may not strictly be Berahino’s first season of playing regular soccer in the Premier League, but is certainly the first season he can say he is a regular starter for West Brom. Last season, he made 32 appearances in the Premier League, but he started only 11 of those games. He did make a positive contribution, though, as he appeared as an early substitute before scoring the winner in West Brom’s famous victory over Manchester United at Old Trafford. He also scored the winning goals against Newcastle and West Ham. However, this season has been even more impressive now that you can say the 21-year-old is a near permanent fixture in the team after starting 24 Premier League games and appearing in all 29 in total. From the first game of the season, Berahino has been a key player after he scored both goals in the 2-2 draw with Sunderland at The Hawthorns. The one thing to note about Berahino is that he tends to score his goals in bursts, such as when he scored six goals in five games in all competitions earlier in this season. That run included a goal at Liverpool and an excellent goal in a 2-2 draw at home to Man United when he sprinted clear of the defense and showed a mature composure to curl his shot past David de Gea. At the start of 2015, he scored six goals in three games, including four against Gateshead in the FA Cup. He also scored the equalizer at West Ham and the winner against Hull. More recently, he scored four goals in five games, including a stunning volley which secured victory at home over Southampton. It means he has scored 18 goals in all competitions for West Brom this season and he seems certain to go on to bigger things. He has had one or two issues off the pitch and he didn’t help himself recently when he admitted that he is keen to move up a level to a bigger club. His manager Tony Pulis feels Berahino has some way to go to be at the level of Harry Kane, who is another Young Player of the Year contender, and it is true that the striker needs to be more consistent. However, he has already been called up once to England’s senior squad and he also has the option of playing for Burundi. 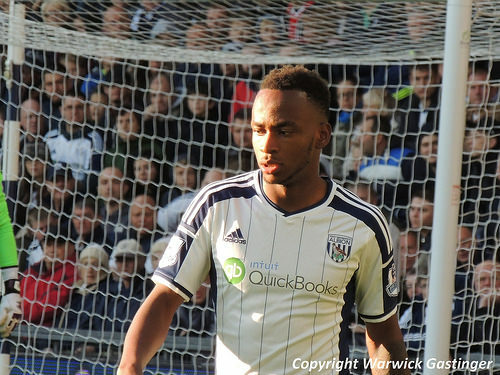 It would be no surprise at all to see Berahino move clubs in the summer. To say it has taken a while for Coquelin to become a key player for Arsenal is an understatement and he did not make his first Premier League appearance of this season until December. However, he has been such an influential figure for Arsenal that he is worthy of consideration as a breakthrough player. He made his Premier League debut for Arsenal in August 2011 in their unforgettable 8-2 defeat at Man United. Though Coquelin was out of his depth in that game, the score was still only 3-1 when he was substituted. He made 10 Premier League appearances in total that season and 11 in the next before spending last year on loan in the Bundesliga with Freiburg. The French midfielder’s future at Arsenal appeared bleak when he joined Charlton in the Championship on loan in November after one appearance in the Capital One Cup against Southampton. But he returned to the Emirates Stadium in December and made three late substitute appearances against Newcastle, Liverpool and QPR. But, since starting Arsenal’s last game of 2014 – a 2-1 win at West Ham – Coquelin has not looked back and has offered the protective shield in front of the defense that had previously been lacking, or at least lacking in terms of ability to fulfil the task. It is perhaps no coincidence that Arsenal’s resurgence into the title race has coincided with the impressive form of Coquelin. From looking likely to be let go by Arsenal at the end of the season, the 23-year-old has now been rewarded with a new contract and has also potentially saved Arsene Wenger some money in the transfer market, which can always be considered a positive! The Burnley striker is enjoying an impressive first season in the Premier League after scoring 21 goals in the Championship last year to help his club to win promotion. The England Under 21 international has yet to demonstrate he can be prolific in the Premier League, after scoring nine goals, but it must always be remembered that he is playing for a team who were always going to struggle and battle against relegation. It is also his all-round game that has been worthy of commendation. As you would expect for a young player, Ings took time to adjust to playing in the Premier League and he has improved with each game. His form is a contrast to Leonardo Ulloa at Leicester. Ulloa cost Leicester big money and he scored five goals in his first five Premier League appearances, but has only scored two in the last 22. Ings, meanwhile, scored only once in his first eight games in the league, but has subsequently scored eight in 18. His goals have included both in a 2-1 win at Stoke in November, the winner in an important victory over relegation rivals QPR in January and he also scored at Old Trafford when Burnley lost 3-1. His performance that night troubled the United defense and his clever movement, and constant pressing of the opposition, marked him out as a player who could move up significantly. He is out of contract at the end of the season and he seems certain to leave in the summer. He was wanted by Liverpool in the January transfer window, while United, Manchester City and Chelsea have also been linked with bids. It will be interesting to see if he can make that step up next season. The undoubted rising star of the season is Tottenham striker Kane, and the fact he is English has also probably helped his cause as well. Like many young players who are only now breaking into the first team at a Premier League club, Kane enjoyed loan spells earlier in his career to build up experience at Leyton Orient, Millwall, Norwich and Leicester. It is fair to say that, at the start of this season following Mauricio Pochettino’s appointment as manager, he still wasn’t deemed ready to be first choice. But everything changed after his lively performance as a substitute against Aston Villa in early November when he scored the late winner in a 2-1 success. Prior to that, Kane had scored a hat-trick against Asteras in the Europa League and scored against Brighton in the Capital One Cup. But his goal at Villa kick-started his Premier League career and he is now one of the first names put down by Pochettino. He has shown he can deliver in big games as well, scoring twice and terrorising the Chelsea defenders in a 5-3 win for Spurs at White Hart Lane on New Year’s Day and scoring both goals in the north London derby win over Arsenal. He also kept his cool to score a late penalty to earn a 2-2 draw against West Ham. With 26 goals in all competitions this season, Kane is pushing for a place in the England squad and, with 16 of those goals in the Premier League, he is still a 4/1 shot at the time of writing with BETFAIR to finish as top scorer. As breakthrough seasons go, there have been few quite as impressive as Kane’s over the past decade and more. The question for Kane is whether he will be able to maintain this form next season when he is less of an unknown quantity. Chelsea certainly learned from experience when keeping him quiet in the Capital One Cup final at Wembley and Man United also handled him well recently. To say Mason has been something of a late bloomer would be an understatement. The 23-year-old only made his Premier League debut for Spurs in September. It was also something of a vote of confidence from Pochettino given that his debut was a starting role in the derby against arch rivals Arsenal at the Emirates Stadium. He did not disappoint or let his manager down as Spurs drew 1-1. His last competitive appearance before that came in January 2014 in League One for Swindon in a 3-1 win over Swindon. He has also had loan spells at Yeovil, Doncaster, Millwall and a largely fruitless time in France with Lorient. Mason actually made his debut for Spurs in the UEFA Cup, now the Europa League, in 2008 as a substitute against NEC Nijmegen. Other than that, he made three appearances in the 2012/13 season before his emergence into an important player for Spurs. He has now started 21 games in the Premier League and also recently scored his first goal in the 3-2 home win over Swansea. He has formed an impressive partnership with another young player – Nabil Bentaleb – in midfield, and those two are keeping out players who Spurs have paid big money for, like Paulinho, Etienne Capoue and Benjamin Stambouli. Mason is probably never going to be the type of player who will attract lots of attention or headlines for the way he plays. He gets on with the job and fulfils the duties he has been assigned. But he is economical and efficient in possession, strong in the tackle, he can get up and down the pitch well and he also packs a decent shot from distance, which has yet to bring with it more goals. He fits into the style of play Pochettino wants at Spurs and, just as he did at Southampton, he is not afraid to give young players of limited experience a chance. Mason has grabbed that opportunity with both hands after demonstrating he is keen to make up for lost time now that he is finally playing in the Premier League.